What does 👩‍🦱 - woman, curly hair emoji mean? Check out those curls! The woman, curly haired emoji shows a woman's face with curly hair. The emoji brings greater diversity to our screens, as it gives representation to natural hairstyles, especially afro-textured hair. It's so new, it doesn't even show up in this article! Use your imagination when you see those empty black boxes below, we know you can do it. The woman, curly haired emoji is technically two emoji sequenced into one. It was approved in 2018 under Unicode’s Emoji 11.0 set by combining the woman emoji 👩 and the curly hair emoji component. At the time of this writing, the only platform to roll out the new emoji is Twitter, whose woman boasts blonde curls. Emojipedia’s in-house character features brunette hair. The default color of the woman is yellow, but skin-tone modifiers are available. 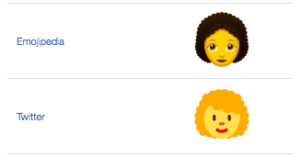 On devices that don’t support it yet, the emoji will display as the woman emoji and an empty box for the curly hair component. Which is basically every device … right now. Many users take to the woman, curly haired to represent black hair and hairstyles, offering greater representation than just the woman emoji with straight, more Eurocentric hair. The woman, curly haired emoji also marks plenty of content dealing with curly hair in general. Since those curls are atop a woman’s head, the emoji is used alongside other woman-based emoji (e.g., woman, red haired 👩‍🦰) to represent women from all walks of life—the sisterhood! For some, the curls give off a youthful look. so the woman, curly haired emoji sometimes is used to signify a young girl.